It’s 4am and I’m awake because the stupid cat was at our door, mistakenly left out. The words are there, too, keeping me from sleep. I return the cat to her room, across the house, and shut the door this time, then lie back in bed. Still, the words won’t leave. “Mom, can we die together?” she asked again the other day, out of the blue. The deep ache burrows into my chest and leaves my eyes burning, even now. I have no good answer, the mystery of life so heavy and so complicated, reminding me that all we have for sure is now. And now is busy, now if full. The five year anniversary of my motherhood approaches and yet I still struggle so much to be present. In fact, I was better then, in the beginning, at stopping to take it all in. Now, two kids, a job, a messy house, a phone that always offers something to pull me away. So many nights I go to bed vowing to actually play with them and then find myself repeating the same cycle of doing all day long. As we drove to a play date at the park today, I saw a sports car wrapped around a pole. The same type of sports car my father drives. We were close to his office and it’s an unusual car. I called my dad, no answer. My confidence started to waver. I called my husband to confirm the badges on the rear bumper, and then I lost my ability to speak. Even though I knew there was a chance it wasn’t him, the magnitude of the possibility was paralyzing. I drove by his parking spot at work and sighed the deepest exhale to see he was there. The girls were confused by my emotion but it was impossible to stifle my relief. Almost two and almost five and there’s no question life is precious and time moves quickly. M is already attempting to potty train herself, a jumble of words that mean real things but aren’t always easy to understand. And, curls, so many curls. E starts kindergarten in September and is bold and outspoken and easily commands a room. Both my babies but less so by the day. Thanks to that cat and all her meowing, they both lie peacefully in our room, asleep. Some may cringe, but truthfully the last month or so of sharing space has offered the deep comfort of knowing we’re all together, safe. My small children sleeping alone across the house just doesn’t feel natural to me, each crackle of the baby monitor drawing my attention from my dreams. In the same room, however, something primal is satisfied by having my babies close. The sweetness of their breath, the occasional reassurance of their touch. It brings us back together from those busy days. Still, I know it’s temporary, and once the kitten grows and stops that damn meowing we’ll all return to the more accepted sleep arrangements we’d worked so hard to create. For now, though, I’m going to relish it. I’ll climb back into bed, make promises to be a more present mother when we awaken, and let the rhythm of their breath lull me back to sleep. Maybe I owe that cat a thank you, after all. 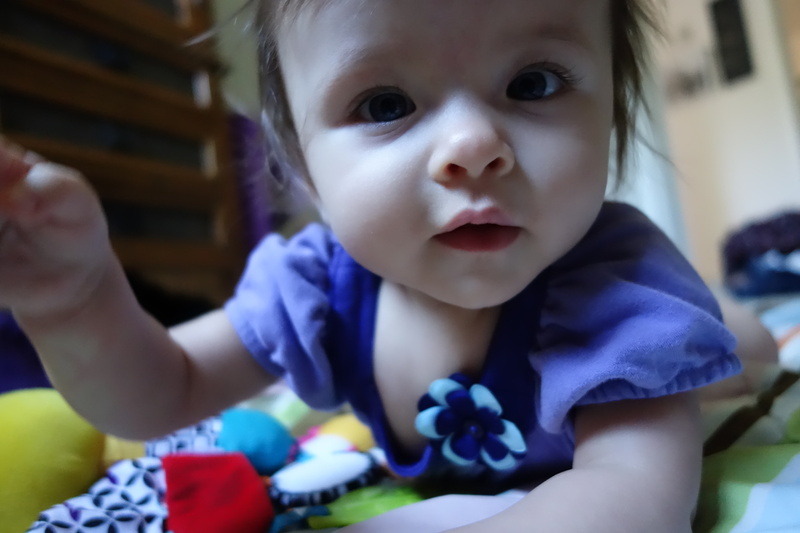 The first few months of E’s life were quiet and slow. We nursed and napped and often that seemed like it. Time moved like taffy, languid and sweet. People often asked if I watched television. The answer was no. My life was an ongoing meditation. Somehow the stillness was enough. With each month, the momentum picked up a little here, a little there. Sometimes the stillness was too much. I contemplated returning to work as a teacher, but I could not do it, I was not ready. Being a stay-at-home mom was more than enough. And, it still is, but my use of time is changing. Forget the labels, SAHM vs WAHM, it is similar enough. Suddenly I am free again, the magic of early bedtimes and well-managed naps. For 2015, I have a schedule. Different chores for different days, focused time use for each block E wakes and sleeps, with spreadsheets to go with it because that is how my brain works. Writing remains my passion, but I also have a different need, a need to get out, meet people, and contribute more immediately to our household income. It is in my bones. I am doing it for me. Like so many in our culture, I don’t know how not to work for financial gain. For better, or for worse, it is hard to say. This year, I am embarking on a new adventure and joining the family business after more than a decade avoiding it. I should have known, really, that one day real estate would officially call my name. My first real job post-college, after all, was real estate consulting. I grew up walking the floor plans of the homes my aunt built, the homes my whole family seemed to sell. When my husband took the plunge, I should have known I would be next. For now, I am assisting my husband with business management, but maybe one day I will also get my license to sell on my own. I did not expect this decision to excite me so much, but it is pretty much the most flexible job I could have with no set number of hours. There is still time in my day to write and be present for my family. It is a win. 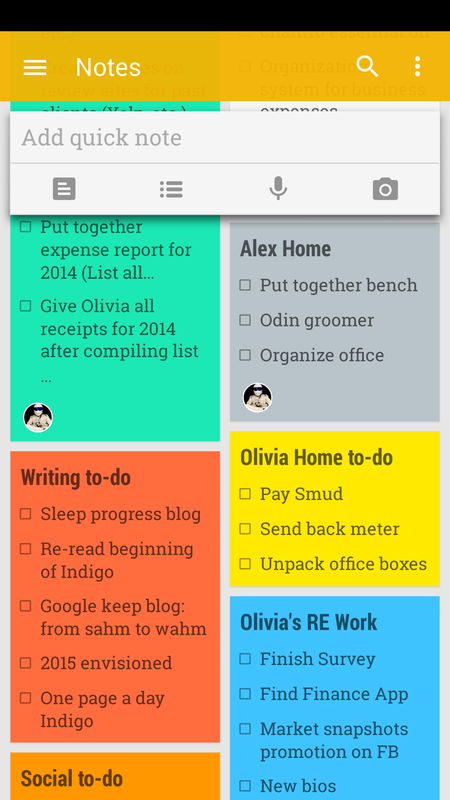 Here is a screenshot of Google Keep on my phone, such a great way to consolidate all those to-do lists. Years ago I read the Happiness Project and it changed my life. Not because it was particularly profound but because it emphasized setting goals and getting organized in the pursuit of living the life you want. That is how getting organized to accomplish my goals makes me feel. Not the smug or obnoxious kind, but just the fulfilled, purposeful, want-to-share kind. As you get organized for the year ahead, I would love to hear your organizational secrets too. Maybe it is better this way, just to leave some words to digest. I feel myself both surrendering and reinventing on a daily basis. I always worried about losing myself in the process of becoming a parent. Instead, I feel I have found myself, but I have to be patient for those moments that are my own. Admittedly, I fight this loss of control. Leaving unfinished tasks drives me crazy, but the feeling of surrender is also beautiful. It is a hard lesson to learn, especially after night upon night of hours spent lying in bed just to keep her asleep. Thank goodness for the glowing words of Dr. Shefali Tsabary on my Kindle. If you haven’t read The Conscious Parent, I highly recommend it. At least this sweet face makes surrender just a little bit easier. If you are a parent, what kind of reinvention have you undergone? Have you surrendered? If so, what are your secrets? If you aren’t a parent, what other parts of your life have forced you to surrender and reinvent?